Odds are that, unless your horse is pregnant, lactating or young with a lot of growing ahead of him, he’s getting sufficient protein from a plentiful supply of high-quality grass or hay. Even if you ride him five days a week, don’t be tempted to add a protein supplement without discussing it with your veterinarian. In fact, excess protein can lead to excessive sweating and dehydration -- a dangerous consequence for horses in a heavy work program. If your veterinarian decides your horse does need additional protein, you have several great natural sources available to you. Horse owners commonly feed alfalfa to give their horses more protein. It’s readily available and, since it’s another type of forage, easily built into a forage-based feeding program. It’s also the odd horse that doesn’t love it! Alfalfa typically contains twice as much protein as grass hay -- 18 percent or more. It’s much higher in calories so if your horse is flirting with obesity, talk to your vet about whether it’s the best protein supplementation. Alfalfa is also high in calcium, which is what makes it ideal for horses that are pregnant, lactating or growing. But the ratio of calcium to phosphorous is not ideal for horses, so you need to analyze other components of his diet to increase his phosphorous. Adding grain or wheat bran will raise the phosphorous levels, but if your horse doesn’t otherwise need grain you may want to look for a protein source other than alfalfa. If you’ve never considered spirulina, a blue-green algae, for your horse, it’s worth considering. It’s a natural source of protein as well as a range of vitamins and nutrients. The protein content is quite high -- about 55 to 70 percent. 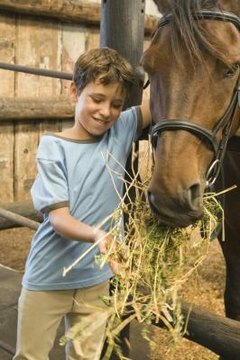 Unlike alfalfa, your horse won’t gain weight from eating spirulina itself, but it can increase his appetite so he’ll eat more of his hay. If your horse is high-strung, spirulina can actually help alleviate his anxiety. Horse owners with horses prone to allergies or breathing problems also feed spirulina to help with those issues. As a natural, whole food, spirulina won’t hurt your horse unless the protein content is too high for him, so speak with your vet about the optimum balance with his current feeding program. Chia seed contains roughly the same protein content as alfalfa, about 19 to 23 percent, but there are no mineral imbalances that can harm your horse. Like spirulina, it’s an ancient, natural food product that is making a resurgence in both the equine and human diets. Unlike the other protein supplements, it also naturally contains omega-3 oil to help balance the omega-6 oil your horse gets from hay and grass. Horse owners concerned about their horses consuming fertilizers and other chemicals that are necessary to ensure weed-free hay may appreciate the antioxidant benefits of chia, blocking some of the harmful effects of chemicals that horses can’t excrete from their body. If your horse needs to gain weight but you want to avoid a commercially prepared and processed feed, consider a reliable standby: oats. In general, oats is an ideal natural grain for horses. Whole oats contain 11 to 13 percent protein, which is sufficient for most horses. If you need a higher protein source, ask your feed store if it can order hull-less oats. In addition to containing as much as 27 percent protein, hull-less oats contain approximately 47 percent fat for your hard keeper -- or thin -- equine. They are a good source of digestible energy so you can feed less than other grains, and the hull-less variety is a great solution for the older or sensitive horse with digestive issues.